Bilateral relations between the countries have been poor, beginning immediately after Pakistan became independent in August 1947. Afghanistan's was the sole vote against Pakistan's admission to the United Nations in 1947, due to Afghan discontent with the permanency of the Durand Line. Afghanistan immediately laid irredentist claims over Pashtun-dominated territories within Pakistan, and demanded renegotiation of the border with the aim of shifting it eastwards to the Indus River, deep within Pakistani territory. Shortly after Pakistani independence, Afghanistan materially supported the failed armed secessionist movement headed by Mirzali Khan against Pakistan. Afghanistan's immediate support of secessionist movements within Pakistan prevented normalised ties from emerging between the two states. In 1952 the government of Afghanistan published a tract in which it laid claim not only to Pashtun territory within Pakistan, but also to the Pakistani province of Balochistan. Diplomatic relations were cut off between 1961 and 1963 after Afghanistan supported more armed separatists in Pakistan, leading to skirmishes between the two states earlier in 1960, and Pakistan's subsequent closure of the port of Karachi to Afghan transit trade. Mohammed Daoud Khan became President of Afghanistan in 1973, Afghanistan—with Soviet support—again pursued a policy of arming Pashtun separatists within Pakistan. The Pakistani military have accused Afghanistan of sheltering various terrorist groups which launch attacks into Pakistan, while Afghan authorities have blamed Pakistan's intelligence agency, the ISI, for funding warlords and the Taliban, and for basing terrorist camps within Pakistani territory to target Afghanistan. There is considerable anti-Pakistan sentiment in Afghanistan, while negative sentiment towards the Afghan refugees is widespread in Pakistan, even in Pashtun-dominated regions. However, former Afghan President Hamid Karzai (in office 2004–2014) has described Pakistan and Afghanistan as "inseparable brothers", which is due to the historical, religious, and ethnolinguistic connections between the Pashtun people and other ethnic groups of both countries, as well as to trade and other ties. Each of the two countries features amongst the other's largest trading partners, and Pakistan serves as a major conduit for transit trade involving landlocked Afghanistan. Southern and eastern Afghanistan is predominately Pashto-speaking, like the adjacent Khyber-Pakhtunkhwa, Federally Administered Tribal Areas, and northern Balochistan regions in Pakistan. This entire area is inhabited by the indigenous Pashtuns who belong to different Pashtun tribes. The Pashtuns were known historically as ethnic Afghans (and as Pathans in Pakistan and India) and have lived in this region for thousands of years, since at least the 1st millennium BC. The Durand Line border was established after the 1893 Durand Line Agreement between Mortimer Durand of colonial British India and Amir Abdur Rahman Khan of Afghanistan for fixing the limit of their respective spheres of influence. The single-page agreement, which contained seven short articles, was signed by Durand and Khan, agreeing not to exercise political interference beyond the frontier line between Afghanistan and what was then the British Indian Empire. Shortly after the demarcation of the Durand Line, the British began connecting the region on its side of Durand line to the vast and expansive Indian railway network. Concurrently, the Afridi tribesmen began to rise up in arms against the British, creating a zone of instability between Peshawar and the Durand Line. As a result, travel across the boundary was almost entirely halted, and the Pashtun tribes living under the British rule began to orient themselves eastward in the direction of the Indian railways. By the time of the Indian independence movement, prominent Pashtun nationalists such as Abdul Ghaffar Khan advocated unity with the nearly formed Dominion of India, and not a united Afghanistan – highlighting the extent to which infrastructure and instability began to erode the Pashtun self-identification with Afghanistan. By the time of the Pakistan independence movement, popular opinion among Pashtuns was in support of joining the Dominion of Pakistan. Pakistan inherited the Durand Line agreement after its independence in 1947 but there has never been a formal agreement or ratification between Islamabad and Kabul. The Afghan government has not formally accepted the Durand Line as the international border between the two states, claiming that the Durand Line Agreement has been void in the past. This complicated issue is very sensitive to both the countries. The Afghan government worried that if it ever ratified the agreement, it would've permanently divided the 50 million Pashtuns and thus create a backlash in Afghanistan. Pakistan felt that the border issue had been resolved before its birth in 1947. It also feared a revolt from the warring tribes which could eventually have brought the state down as it happened when Ahmad Shah Durrani unified the Pashtuns and toppled the Mughal Empire of India. This unmanagable border has always served as the main trade route between Afghanistan and the South Asia, especially for supplies into Afghanistan. Shortly after Pakistan gained independence in 1947, Afghanistan crafted a two-fold strategy to destabilize the frontier regions of Pakistan, in an attempt to take advantage of Pakistan's post-independence instability. Firstly, it strongly aligned itself with Pakistan's rival, India, and also the USSR. Secondly, it politically and financially backed secessionist politicians in the Khyber Pakhtunkhwa in the 1960s. In January 1950, the Afghan king, Mohammed Zahir Shah, had an anti-Pakistan speech which was condemned by Pakistan's Liaquat Ali Khan. A serious incident took place on September 30, 1950 when Pakistan claimed Afghan troops had crossed into their territory near the Bogra Pass as a low-scale invasion. The Afghan government denied involvement, saying they were pro-Pashtunistan tribesmen. Zahir Shah mentioned in a 1952 speech the friendly feelings towards Pakistan, but that the Pashtunistan issue cannot be ignored. The 1954 military pact between Pakistan and the United States concerned Afghanistan and India, and it brought Afghanistan closer to the Soviet Union but whilst maintaining non-alignment. The Afghan government denounced the merger of West Pakistan provinces, and on March 30, 1955, Afghan demonstraters attacked the Pakistani embassy and consulates in Kabul, Kandahar and Jalalabad. Pakistan retaliated by closing the border, an economic blockage. Diplomatic relations were restored in September. Again due to the Pashtunistan issue, the two countries accused each other of border mispractices in 1961. In August, the consulates in both countries closed and relations were broken in September 1961. The situation was not defused until about 1965. Afghanistan's policies placed a severe strain upon Pakistan–Afghan relations in the 1960s, up until the 1970s, when the movement[which?] largely subsided as the population came to identify with Pakistan; although, resentment against the Punjabi elite continued to develop. The Pashtun assimilation into the Pakistani state followed years of rising Pashtun influence in Pakistani politics and the nation's bureaucracy, culminating in Ayub Khan, Yahya Khan, Ishaq Khan – all Pashtuns, attaining leadership of Pakistan. The largest nationalist party of the time, the Awami National Party (ANP), dropped its secessionist agenda and embraced the Pakistani state, leaving only a small Pakhtunkhwa Millat Party to champion the cause of independence in relation to both Pakistan and Afghanistan. Despite the weaknesses of the early secessionist movement, this period in history continues to negatively influence Pakistani-Afghan relations in the 21st century, in addition to the province's politics..
George Crile III and Charlie Wilson (Texas politician) with an unnamed political personality in the background (person wearing the aviator glasses looking at the photo camera). They were the main players in Operation Cyclone, the code name for the United States Central Intelligence Agency program to arm and finance the multi-national mujahideen during the Soviet–Afghan War, 1979 to 1989. During the 1980s, the Durand Line was heavily used by Afghan refugees fleeing the Soviet occupation in Afghanistan, including a large number of Mujahideen insurgent groups who crossed back and forth. Pakistan became a major training ground for roughly 250,000 foreign mujahideen fighters who began crossing into Afghanistan on a daily basis to wage war against the communist Afghanistan and the Soviet forces. The mujahideen included not only locals but also Arabs and others from over 40 different Islamic nations. Many of these foreign fighters married local women and decided to stay in Pakistan, among them were radical Muslims such those of Saudi-led Al-Qaeda and Egyptian Muslim Brotherhood as well as prisoners from Arab countries. Relations between the two countries remained hostile during the Soviet-Afghan War. Afghan President Babrak Karmal refused to improve relations with Pakistan due to their refusal to formally recognize the PDPA government. Following the death of Pakistani President Zia-ul-Haq in 1988, U.S. State Department blamed WAD (a KGB created Afghan secret intelligence agency) for terrorist attacks inside Pakistan in 1987 and 1988. With funds from the international community channeled through the United Nations High Commissioner for Refugees (UNHCR), Pakistan hosted over 3 million Afghans at various refugee camps, mainly around Peshawar in Khyber Pakhtunkhwa. The United States and others provided billions of dollars in humanitarian assistance to the refugees. There were no regular schools provided for the refugees but only madrasas in which students were trained to become members of the Taliban movement. When the Soviet Union began leaving Afghanistan, during the Presidency of Mohammad Najibullah, the UNHCR and the international community assisted 1.5 million Afghan refugees in returning to Afghanistan. Pakistan were also thought to have played a part in the attempted coup in 1990 against Najibullah's government. Although the victorious mujahideen formed a government in 1992 through the Peshawar Accords, Pakistan remained unhappy with new leaders Rabbani and Massoud, including their foreign policy of maintaining friendly relations with India as during the communist era. Pushing for a "trusted" friendly government in Afghanistan, the Pakistani intelligence started funding Hekmatyar-the only mujahideen commander not to sign the Accords-to fight against the new Afghan government in hopes that he would win and install a new government. Through Pakistani funding, Hekmatyar's forces sieged Kabul city with thousands of rockets for three years, killing thousands. However upon realizing that Hekmatyar was unable to take power in Kabul, Pakistan looked elsewhere. The Taliban movement had just formed with the help of then-Pakistani Interior Minister, Naseerullah Babar, and the Pakistani intelligence threw its weight behind the new movement. Around September 1994, the Taliban movement captured the Afghan city of Kandahar and began its long conquest with help from Pakistan. The Taliban claimed that they wanted to clean Afghanistan from the warlords and criminals. According to Pakistan and Afghanistan expert Ahmed Rashid, "between 1994 and 1999, an estimated few Pakistanis volunteers trained and fought in Afghanistan" keeping the Taliban regime in power. The role of the Pakistani military during that time has been described by some international observers as a "creeping invasion" of Afghanistan. UN documents also reveal the role of Arab and Pakistani support troops in the Taliban massacre campaigns. In late 1996, the Islamic Emirate of Afghanistan emerged and established close relations with neighbouring Pakistan. However, the relations began to decline when the Taliban refused to endorse the Durand Line despite pressure from Islamabad, arguing that there shall be no borders among Muslims. When the Islamic Emirate of Afghanistan was toppled and the new Afghan government was formed, President Hamid Karzai began repeating the previous Taliban statement. A line of hatred that raised a wall between the two brothers. Afghan President Hamid Karzai with U.S. President Barack Obama and Pakistani President Asif Ali Zardari during a US-Afghan-Pakistan Trilateral meeting at the White House in Washington, DC. The Karzai administration in Afghanistan has close relations with the Pakistan's Awami National Party (ANP) and the Pakistan Peoples Party (PPP). In 2006, Afghan President Hamid Karzai warned that "Iran and Pakistan and others are not fooling anyone" when it comes to interfering in his country. "If they don’t stop, the consequences will be … that the region will suffer with us equally. In the past we have suffered alone; this time everybody will suffer with us.… Any effort to divide Afghanistan ethnically or weaken it will create the same thing in the neighboring countries. All the countries in the neighborhood have the same ethnic groups that we have, so they should know that it is a different ball game this time." The Durand Line border has been used in the last decade as the main supply route for NATO-led forces in Afghanistan as well as by Taliban insurgents and other militant groups who stage attacks inside Afghanistan. The American government decided to rely on drone attacks, which began to negatively affect the US-Pakistan relations. 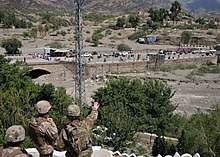 U.S. Armed Forces checking the border checkpoint at Torkham, between Nangarhar Province of Afghanistan and Khyber Pakhtunkhwa in Pakistan. In 2007, Afghan intelligence captured Muhammad Hanif, the Taliban spokesman. During his interrogation which was recorded, Hanif claimed that the Taliban leader was being kept in Quetta under the protection of the ISI. Pakistan denied the claims. Relations have become more strained after the Afghan government began openly accusing Pakistan of using its ISI spy network in aiding the Taliban and other militants. Pakistan usually denies these allegations but has said in the past that it does not have full control of the actions of the ISI. There have been a number of reports about the Afghanistan–Pakistan skirmishes, which usually occur when army soldiers are in hot pursuit chasing insurgents who cross the border back and forth. This leads to tensions between the two states, especially after hearing reports of civilian casualties. After the May 2011 death of Osama bin Laden in Pakistan, many prominent Afghan figures began being assassinated, including Mohammed Daud Daud, Ahmad Wali Karzai, Jan Mohammad Khan, Ghulam Haider Hamidi, Burhanuddin Rabbani and others. Also in the same year, the Afghanistan–Pakistan skirmishes intensified and many large scale attacks by the Pakistani-based Haqqani network took place across Afghanistan. This led to the United States warning Pakistan of a possible military action against the Haqqanis in the Federally Administered Tribal Areas. The U.S. blamed Pakistan's government, mainly Pakistani Army and its ISI spy network as the masterminds behind all of this. "In choosing to use violent extremism as an instrument of policy, the government of Pakistan, and most especially the Pakistani army and ISI, jeopardizes not only the prospect of our strategic partnership but Pakistan's opportunity to be a respected nation with legitimate regional influence. They may believe that by using these proxies, they are hedging their bets or redressing what they feel is an imbalance in regional power. But in reality, they have already lost that bet." U.S. Ambassador to Pakistan, Cameron Munter, told Radio Pakistan that "the attack that took place in Kabul a few days ago, that was the work of the Haqqani network. There is evidence linking the Haqqani Network to the Pakistan government. This is something that must stop." Other top U.S. officials such as Hillary Clinton and Leon Panetta made similar statements. Despite all of this, Afghan President Hamid Karzai labelled Pakistan as Afghanistan's "twin brother". Such words in diplomatic talks mean that Afghanistan cannot turn enemy against the state of Pakistan to please others. The two states are working together to find solutions to the problems affecting them. This includes possible defence cooperation and intelligence sharing as well as further enhancing the two-way trade and abolishment of visas for "holders of diplomatic passports to facilitate visa free travel for the diplomats from the two nations." After the May 2017 Kabul attack, the Afghan National Directorate of Security (NDS) claimed that the blast was planned by the Afghan insurgent group Haqqani Network, and reiterated allegations that those elements had support and presence across the border in Pakistan. Afghan President Ashraf Ghani stated that Pakistan has instigated an "undeclared war of aggression" against the country. Pakistan's Foreign Ministry spokesman, Nafees Zakaria rejected the Afghan allegations as "baseless". In 2015, Inter-Services Intelligence and National Directorate of Security inked an memorandum of understanding. Under the memorandum of understanding, both nations agreed to fight terrorism together and also to share intelligence information. On 16 May 2015, Pakistan army launched a daring operation to save the life of an injured Afghan soldier on the Afghanistan side of the border. The soldier was injured in clash with the militants and he was evacuated by the Pakistan military. There are have been instances where Afghan soldier injured in fighting the militants near the Pakistan Afghanistan border are sent to Pakistan for treatment. In July 2010, a Memorandum of understanding (MoU) was reached between Pakistan and Afghanistan for the Afghan-Pak Transit Trade Agreement (APTTA), which was observed by U.S. Secretary of State Hillary Clinton. The two states also signed an MoU for the construction of rail tracks in Afghanistan to connect with Pakistan Railways (PR), which has been in the making since at least 2005. In October 2010, the landmark APTTA agreement was signed by Pakistani Commerce Minister Makhdoom Amin Fahim and Anwar ul-Haq Ahady, Afghan Ministry of Commerce. The ceremony was attended by Richard Holbrooke, U.S. Special Representative for Afghanistan and Pakistan, and a number of foreign ambassadors, Afghan parliamentarians and senior officials. The APTTA allows Afghan trucks to drive inside Pakistan to the Wagah border with India, including to the port cities of Karachi and Gwadar. In November 2010, the two states formed a joint chamber of commerce to expand trade relations and solve the problems traders face. The APTTA agreement has taken effect after several Afghan trucks delivered fruits from Afghanistan to the Wagah border with India in June 2011. With the completion of the APTTA, the United States and other NATO states are planning to revive the ancient Silk Road. This is to help the local economies of Afghanistan and Pakistan by connecting South Asia with Central Asia and the Middle East. The APTTA is intended to improve trade between the two countries but Pakistan often delays Afghan-bound containers, especially after the 2011 NATO attack in Pakistan. In July 2012, Afghanistan and Pakistan agreed to extend APTTA to Tajikistan in what will be the first step for the establishment of a North–South trade corridor. The proposed agreement will provide facilities to Tajikistan to use Pakistan's Gwadar and Karachi ports for its imports and exports while Pakistan will enjoy trade with Tajikistan under terms similar to the transit arrangement with Afghanistan. Trade between Pakistan and Afghanistan is expected to reach $5 billion by 2015. Afghanistan's economy is one of the fastest growing economies in the world. A 2012 World Bank report added, "In contrast, Afghanistan’s economy grew robustly by about 11 percent mostly due to a good harvest." Towards the end of the same year, both the governments of Afghanistan and Pakistan drafted plans to talk to the Taliban. Cooperation between the two countries includes possible defence cooperation and intelligence sharing as well as further enhancing the two-way trade and abolishment of visas for diplomats from the two nations. ^ Qassem, Dr Ahmad Shayeq (2013-03-28). Afghanistan's Political Stability: A Dream Unrealised. Ashgate Publishing, Ltd. ISBN 9781409499428. ^ Shaikh, Najmuddin A. (December 27, 2011). "What does Pakistan want in Afghanistan?". The Express Tribune. Retrieved 2014-07-12. ^ Mashal, Mujib (December 2, 2012). "Can Afghanistan Sort Out Its Cross-Border Water Issues?". Time. Retrieved 2014-07-12. ^ a b Qassem, Dr Ahmad Shayeq (2013-03-28). Afghanistan's Political Stability: A Dream Unrealised. Ashgate Publishing, Ltd. ISBN 9781409499428. ^ Sohail, Massarrat (1991). Partition and Anglo-Pakistan relations, 1947-51. Vanguard. ISBN 9789694020570. ^ Misra, Kashi Prasad (1981). Afghanistan in crisis. Croom Helm. ISBN 9780709917274. ^ a b Weisburd, Arthur Mark (1997-04-25). Use of Force: The Practice of States Since World War II. Penn State Press. ISBN 978-0271043012. ^ Malik, Hafeez (2016-07-27). Soviet-Pakistan Relations and Post-Soviet Dynamics, 1947–92. Springer. ISBN 9781349105731. ^ Hussain, S. Iftikhar (2000). Some major Pukhtoon tribes along the Pak-Afghan border. Area Study Centre. ^ Hilali, A. Z. (2017-07-05). US-Pakistan Relationship: Soviet Invasion of Afghanistan. Taylor & Francis. ISBN 9781351876230. ^ Fair, C. Christine; Watson, Sarah J. (2015-02-18). Pakistan's Enduring Challenges. University of Pennsylvania Press. ISBN 9780812246902. ^ "Afghan leader slams Pakistan over Kabul attacks". www.aljazeera.com. ^ Naveed Siddiqui (5 March 2017). "Afghanistan will never recognise the Durand Line: Hamid Karzai". Retrieved 28 June 2017. ^ "Deterioration in Pak-Afghan Relations". ^ "Afghanistan Reacts Angrily to Pakistan's Fencing of Border". ^ "Pakistan wants millions of Afghan refugees gone. It's a humanitarian crisis waiting to happen". Public Radio International. Retrieved 2018-02-26. ^ The Strategic Implications of Change in the Soviet Union. Brassey's for the International Institute for Strategic Studies. 1990. ^ Lindsey, George; Spanger, Hans-Joachim; Sirriyeh, Hussein; Gambles, Ian; Studies, International Institute for Strategic; Wittmann, Klaus; Ispahani, Mahnaz Z.; Dziedzic, Michael J.; Kunzendorff, Volker (1989). The impact of strategic defences on European-American relations in the 1990's. Brassey's for the International Institute for Strategic Studies. ISBN 9780080373379. ^ Constable, Pamela; Khan, Haq Nawaz (2017-03-03). "Pakistan targets Afghan Pashtuns and refugees in anti-terrorism crackdown". Washington Post. ISSN 0190-8286. Retrieved 2018-02-26. ^ a b Muzhary, Fazal (October 28, 2010). "Landmark trade pact inked with Pakistan". Kabul, Afghanistan: Pajhwok Afghan News (PAN). Archived from the original on March 13, 2012. Retrieved October 28, 2010. ^ "Country Profile: Afghanistan" (PDF). Washington, DC: Library of Congress Country Studies on Afghanistan. August 2008. Archived from the original (PDF) on 2005-02-26. Retrieved 2010-09-03. ^ Nath, Samir (2002). Dictionary of Vedanta. Sarup & Sons. p. 273. ISBN 978-81-7890-056-8. Retrieved 2010-09-10. ^ "Afghan and Afghanistan". Abdul Hai Habibi. alamahabibi.com. 1969. Retrieved 2010-10-24. ^ Smith, Cynthia (August 2004). "A Selection of Historical Maps of Afghanistan - The Durand Line". United States: Library of Congress. Archived from the original on 6 February 2011. Retrieved 2011-02-11. ^ Electoral History of NWFP (PDF). Archived from the original (PDF) on 10 August 2013. ^ Michael Brecher (2017-07-25). A Century of Crisis and Conflict in the International System: Theory and Evidence: Intellectual Odyssey III. Springer. ISBN 9783319571560. Retrieved 25 July 2017. ^ a b Grare, Frédéric (2006). "Carnegie Papers - Pakistan-Afghanistan Relations in the Post-9/11 Era" (PDF). carnegieendowment.org. Retrieved 2010-09-03. ^ "[CHRONOLOGY, 9 OCTOBER 195222 OCTOBER 1952]". Chronology of International Events and Documents. 8 (20): 613–643. 1952. JSTOR 40545330. ^ "Breakthrough or Breakdown? U.S.-Pakistan Military Alliance of 1954 | Page 3 of 6". 2011-11-22. ^ "Ahmad Shah Masoud". Encyclopædia Britannica. Retrieved 2012-12-18. Masoud, an ethnic Tajik, studied engineering before the Soviet intervention in Afghanistan and then moved to Pakistan for military training. ^ Craggs, Ryan (February 1, 2012). "Taliban Will Control Afghanistan With Support From Pakistan, Says Leaked Report". Huffington Post. Retrieved 2012-12-18. ^ "START | Terrorist Organization Profile". Start.umd.edu. 2008-03-01. Retrieved 2010-06-21. ^ a b "START | Terrorist Organization Profile". Start.umd.edu. ^ "Pakistan Knocking at the Nuclear Door". Time. March 30, 1987. Retrieved 2010-05-24. ^ "Reinforcing the Mujahideen: Origins of Jihadi Manpower". The Jamestown Foundation. May 9, 2006. Retrieved 2012-12-19. ^ Qassem 2009, p. 78. ^ Kaplan, Robert D. (August 23, 1989). "How Zia's Death Helped the U.S". The New York Times. Retrieved 2010-05-24. ^ Pear, Robert (June 25, 1989). "F.B.I. Allowed to Investigate Crash That Killed Zia". The New York Times. Retrieved 2010-05-24. ^ Pakistan Restricts Afghan Refugees by Donatella Lorch for the New York Times. November 16, 1988. ^ "Taliban". Encyclopædia Britannica. Retrieved 2012-12-18. ^ "Afghan Refugees: Current Status and Future Prospects" (PDF). January 26, 2007. Retrieved 2012-12-19. 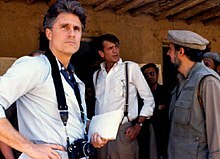 In 1988, the Soviet Union agreed to withdraw from Afghanistan, and UNHCR and the international assistance community prepared for the massive repatriation of refugees. Large-scale returns did not begin until 1992, however, when the Soviet-installed leader Najibullah was finally forced from power. No sooner had some million and a half refugees returned, however, than Kabul descended into armed disorder as various mujahideen factions began fighting for control of the capital and the surrounding area. ^ a b Maley, William (2009). The Afghanistan wars. Palgrave Macmillan. p. 288. ISBN 978-0-230-21313-5. ^ Newsday (October 2001). "Taliban massacres outlined for UN". Chicago Tribune. ^ The Unholy Durand Line, Buffering the Buffer Archived 2012-03-25 at the Wayback Machine by Dr. G. Rauf Roashan. August 11, 2001. ^ Pakistan's Ethnic Fault Line by Selig S. Harrison, The Washington Post. May 11, 2009. ^ "Mullah Omar 'hiding in Pakistan'". 2007-01-17. ^ "Pakistan rejects Taliban spokesman's claim on Omar". Reuters. 2007-01-18. ^ "Push launched against Haqqanis in border areas". Pajhwok Afghan News. Archived from the original on 2012-05-14. Retrieved 2015-02-07. ^ "President Karzai Address to the Nation on Afghanistan's Peace Efforts". The Embassy of Afghanistan in Washington, DC. Archived from the original on 2011-10-12. Retrieved 2011-10-10. ^ "Panetta: U.S. will pursue Pakistan-based militants". USA Today. September 2011. Retrieved 2011-09-21. ^ a b "U.S. blames Pakistan agency in Kabul attack". Reuters. September 22, 2011. Archived from the original on 2011-09-25. Retrieved 2011-09-22. ^ "Pakistan condemns US comments about spy agency". Associated Press. September 23, 2011. Archived from the original on July 27, 2013. Retrieved 2011-09-23. ^ Pakistan a twin brother, talks to go on: Karzai. Pajhwok Afghan News. Sujoy Dhar. October 5, 2011. ^ a b "Reports: Kabul may consider Pakistan offer". UPI. 29 January 2013. Retrieved 2013-01-29. ^ a b c "Pakistan to release more Taliban prisoners". Pajhwok Afghan News. 1 December 2012. Retrieved 2013-01-29. ^ Gul, Ayaz. "Deadly Truck Bomb Rocks Kabul". VOA. ^ Kay, Chris; Najafizada, Eltaf (6 June 2017). "Ghani Says Afghanistan Hit by 'Undeclared War' From Pakistan". Bloomberg. Retrieved 8 June 2017. ^ "Afghanistan blames Pakistan and Taliban for Kabul blast". Al Jazeera. ^ "NDS and ISI Sign MoU". Tolo news. 17 May 2015. ^ "ISI, Afghan intelligence in landmark deal". Dawn News. 19 May 2015. ^ "Pakistani troops cross border into Afghanistan, rescue wounded Afghan soldier". Khaama Press. 16 June 2015. ^ "Afghan soldier returns home after treatment in Pakistan". The News. 9 March 2016. ^ "Afghan soldier returns home after treatment". Express tribune. 30 July 2016. ^ Kakar, Javed Hamim (Jul 7, 2010). "Pakistan, Afghanistan ink MoU on rail links". Pajhwok Afghan News. Archived from the original on 2012-03-13. Retrieved 2010-07-12. ^ "Pak-Afghan bus and rail links discussed". Pajhwok Afghan News. 2 July 2005. Retrieved 2010-10-28. ^ Landler, Mark (July 18, 2010). "Afghanistan and Pakistan Sign a Trade Deal, Representing a Thaw in Relations". The New York Times. Archived from the original on June 13, 2013. Retrieved 2010-09-03. ^ Siddiqui, Abdul Qadir (November 29, 2010). "Afghan-Pakistan chamber of commerce set up". Pajhwok Afghan News. Archived from the original on 2011-07-27. Retrieved 2010-12-10. ^ Siddiqui, Abdul Qadir (December 5, 2010). "Pakistan to resolve Afghan traders' problems". Pajhwok Afghan News. Archived from the original on 2011-07-27. Retrieved 2010-12-10. ^ "Coalition eyes "silk road" to boost Afghan economy". ^ "Millions of books for Afghan students stuck in Pakistan". Pajhwok Afghan News. Archived from the original on 2012-07-25. Retrieved 2015-02-07. ^ "Afghan-Pakistan Trade Transit Deal Extended to Tajikistan". The Gazette of Central Asia. Satrapia. 23 July 2012. Retrieved 2012-07-23. ^ Haseeb, Meena (2013-01-16). "Afghanistan economy growth strong in 2012: World Bank". Khaama Press. Retrieved 2014-07-12. ^ "Afghanistan, Pakistan Draft Plan for Talks With Taliban". Eltaf Najafizada. Bloomberg. ^ "Meets Ghani, Abdullah: Gen Raheel offers to train Afghan security forces". The Express Tribune. 7 November 2014. Retrieved 2014-11-07. ^ Khan, Tahir (5 February 2015). "First group of Afghan army cadets arrives for training at PMA". Express Tribune. Retrieved 2015-02-07.